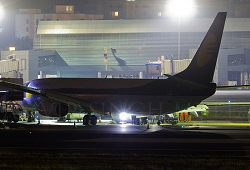 On landing runway 27 in darkness, when the 737 was about to vaacate into taxiway „November 9“ at the far end, its right maingear suddenly gave way. The right engine nacelle as well as the right wingtip contacted the ground resulting in unknown damage before the 737 came to a stop. It appears the strut of the right right landing penetrated the wing causing further damage. There were no reports about any injuries among the 128 occupants. The disabled aircraft was towed to a hangar the following morning. All traffic was diverted to runway 14/32. 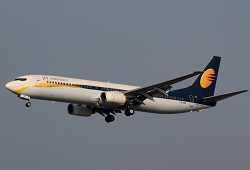 According to the airline, the pilots reported a technical fault within the landing gear on the approach. 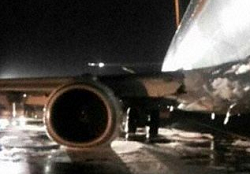 They also reported an oil leak within the right maingear calling for emergency equipment on stand-by.